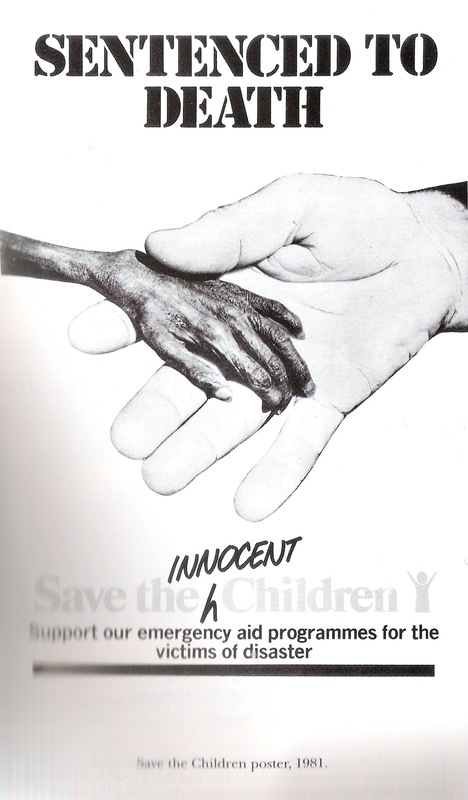 On the left is a Save the Children poster published in 1981, to widespread condemnation. On the right, an advert that appeared online last week alongside a rolling deluge of other similar advertisements and raised no major objections. One is designed to shock, the other to demand, and both invoke a sense of shame in you, the passive reader. But armed with moral superiority and the certainty that they have the answer – these adverts offer problem and solution in one neat package. Peddling in the trade of morality and saving lives, it seems to me supremely important for aid agencies to properly assess how they represent the people they aim to serve. For what is the point in raising money to secure the humanity of those affected by crisis, if in the process, those same people become reduced to helpless victims and empty stereotypes, stripped of the very humanity their ‘saviours’ wish to restore? This is an old argument. Following the horror of the Ethiopian famine, there was collective agreement over the need for more sensitive and dignified portrayal of disaster ‘victims’. Amongst other initiatives, in 1994 the IFRC stipulated in its Code of Conduct that: In our information, publicity and advertizing activities, we shall recognize disaster victims as dignified human beings, not hopeless objects. Since then, the humanitarian sector has grown rapidly and chaotically into a multi million dollar industry, with massive interventions across large parts of the globe and a powerful public profile. As technology has evolved, so agencies have become increasingly media savvy, with dedicated media/comms departments and sophisticated marketing techniques capable of bringing in even larger sums of money. I am an aid worker, and despite spending a lot of time angry, frustrated and generally cynical, I remain fiercely wedded to the idea that trying to help people in war or disaster is an essentially good and necessary thing. So I suppose I should feel proud of the scale of influence that agencies now manage to wield through modern media. Yet the hyperbole, disturbing imagery and pervading sense of hubris, cloud any real feelings of achievement and often make me cringe. What is presented by agencies to the general public seems completely removed from the realities of actually providing humanitarian assistance, and the imagery used is only getting worse. 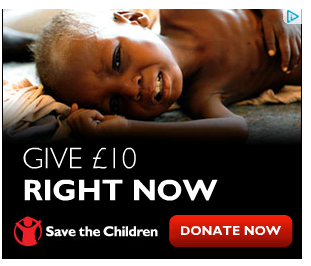 The ends-justifies-means argument would point the money raised and numbers saved as a result. Yet this position, standing opposed to ethical purism, is a tired dichotomy and completely misses the complex reality of providing assistance in a conflict environment. Having money doesn’t mean aid will actually be delivered effectively and appropriately. And as part of a sector that is trying so desperately to professionalise, surely we should have grown more sophisticated in our relations with the giving public, beyond ordering them to ‘Give £10: Right Now’?